Bring your imagination to life through cartoons in the style of Nickelodeon or Cartoon Network. 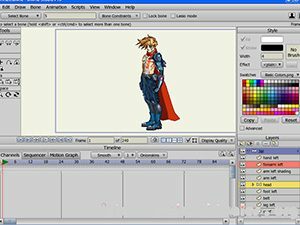 Using an intuitive 2D animation software you will work with drawing tools, bone-rigging system, animation timeline, sound and special effects. Start with your characters, which can be imported or created. Next, you will add “bones”, and then edit with multiple layers, sounds and special effects. This course is a fun and exciting way to introduce students to the professional animated cartoon skills.